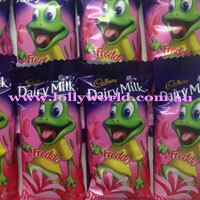 Cadbury Freddo Strawberry Pond a Cadbury dairy milk chocolate with a strawberry cream filling. Definitely a favourite among the Lollyworld staff. Purchase in 5 pack bag or the box of 72. Cadbury Freddo Strawberry Pond a Cadbury dairy milk chocolate with a strawberry cream filling. Definitely a favourite among the Lollyworld staff. Purchase in 5 x 15g pack bag or the box of 72.